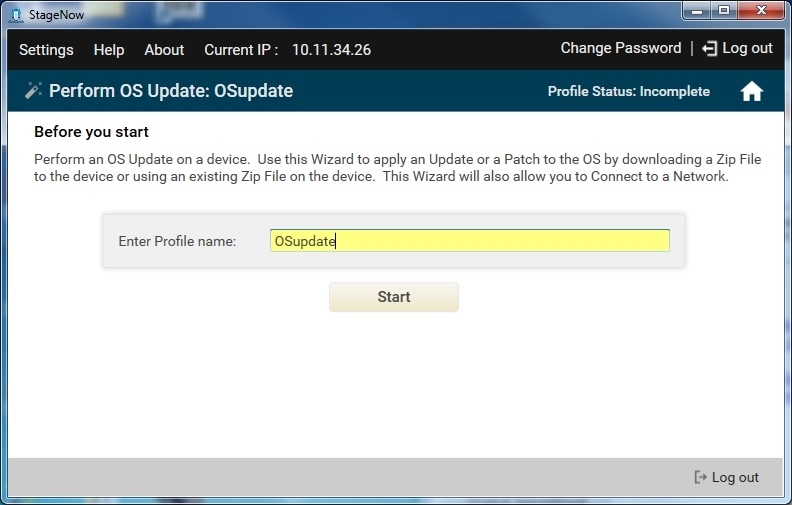 Use this Wizard to perform an OS update on a device. 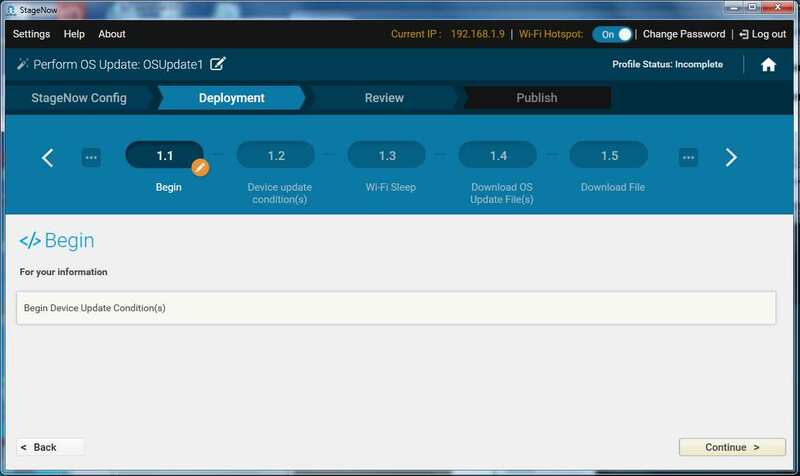 The OS Update action applies an update or patch to the OS by downloading a .zip file to the device or using a .zip file that exists on the device. This Wizard allows connection to a network. 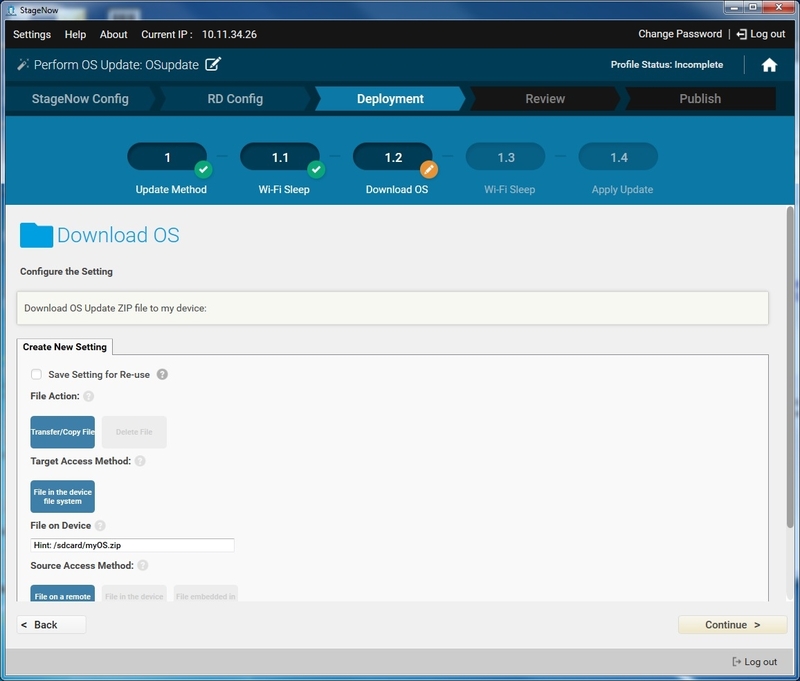 Select the "Perform OS Update" Wizard, and click "Create" to continue. Enter a name for the profile and click "Start" to continue. 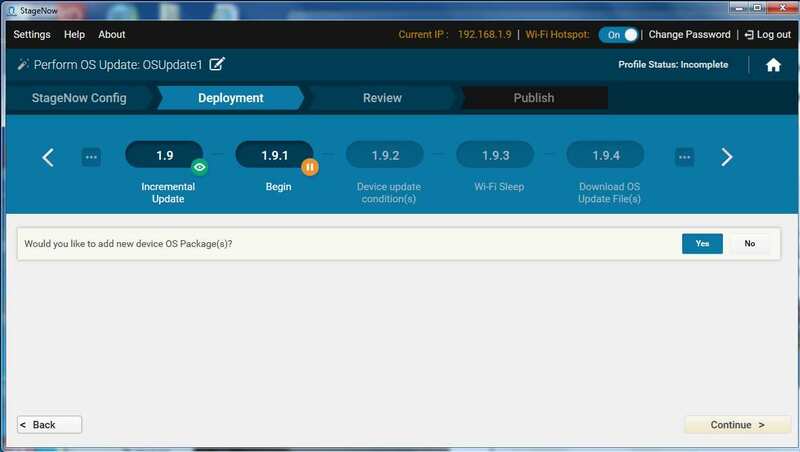 If connecting to this network using StageNow barcodes, click "Yes" and click "Continue" to proceed (see Profiles / Connect Network for instructions on connecting to a network and populating the settings window). 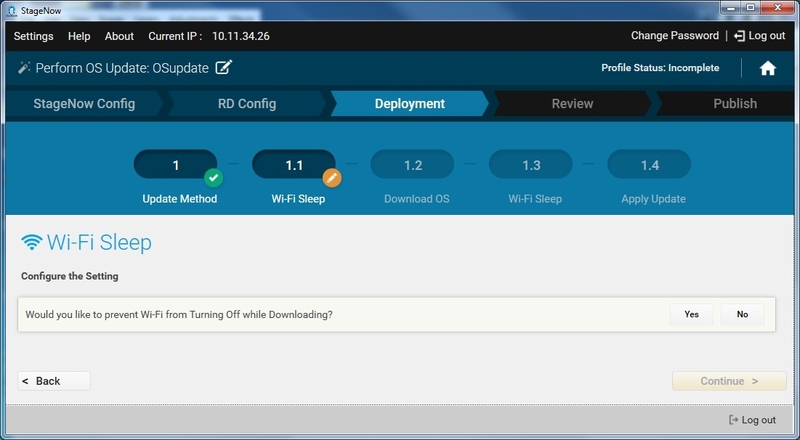 If offered, select whether to connect to this network using the Rapid Deployment (RD) Client. 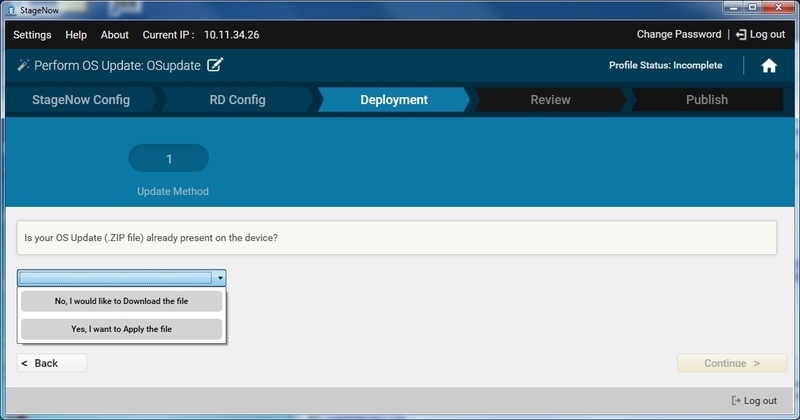 Note that the RD Config section appears only if Legacy Mode is enabled in the Settings screen. 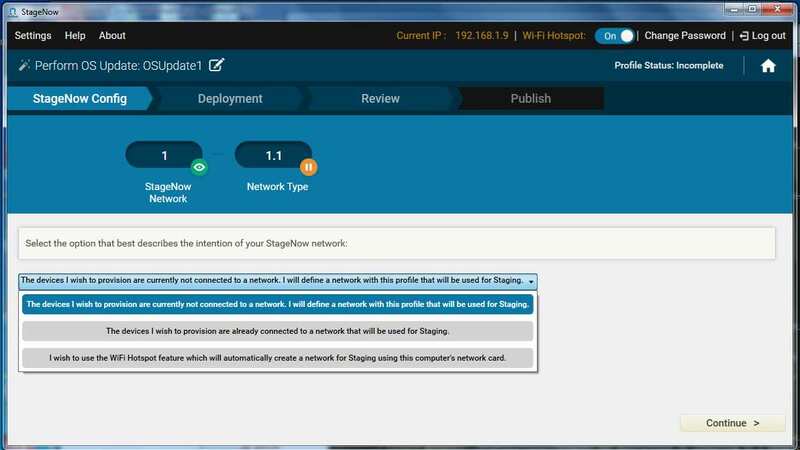 Click "Yes" for devices that don't include the StageNow Client (see Rapid Deployment (RD) Client for more information). To push an OS update .zip file to the device, select "No, I would like to Download the file." To use an OS update .zip file that already resides on the device, select "Yes, I want to Apply the file." Select "Continue" to apply the update and proceed to the Review window. 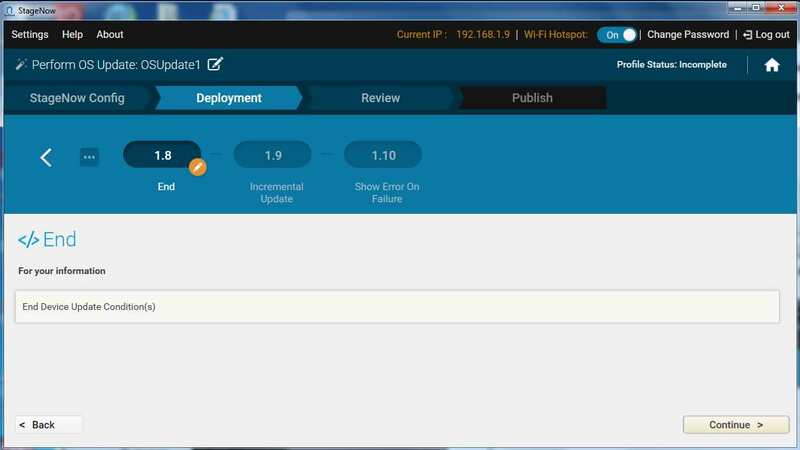 The incremental update is used to perform OS updates on multiple devices based on defined conditions present on specific target devices. For example, if seeking to perform an operation only on TC51 devices, a condition could be defined that checks for the string "TC51" in the Product Model field. For more information, see the Condition Manager guide. Incremental OS Update is supported only on devices with MX 6.0 or higher. Select the MX version from the drop-down menu (must be MX 6.0 or higher). 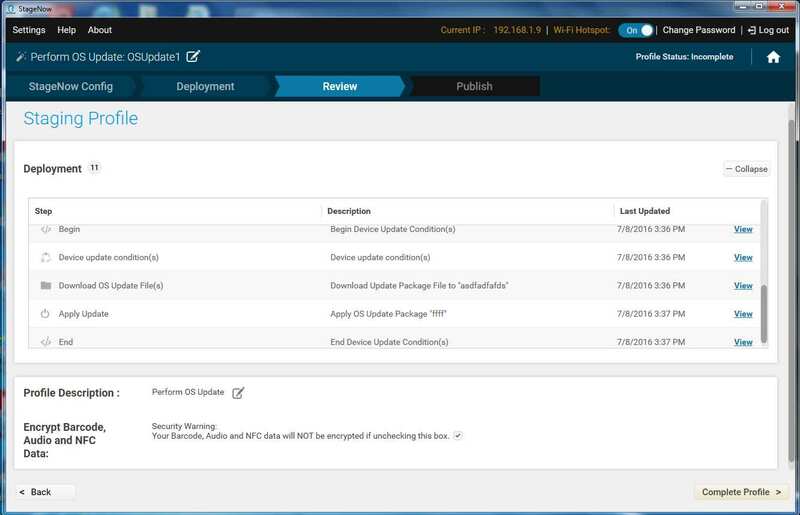 Select the "Perform OS Update Wizard" and click "Create" to continue. Enter a name for the profile; click "Start" when done. If selecting the second or third option, skip to Step 7. 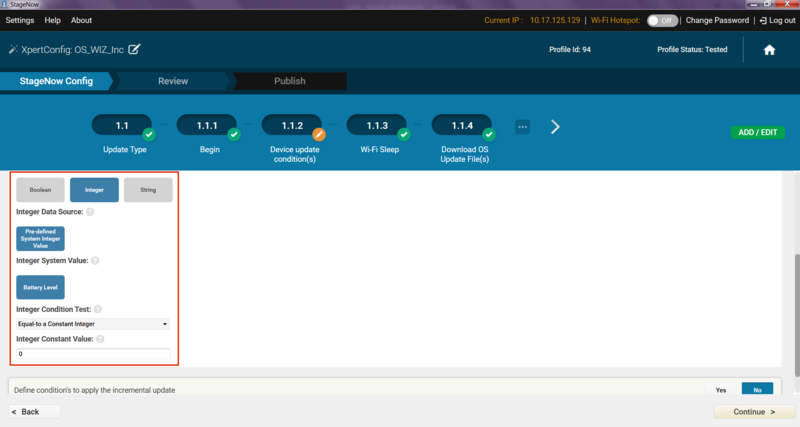 If connecting to this network using StageNow barcodes, click "Yes" and click "Continue" (see Profiles / Connect Network for instructions on connecting to a network and populating the settings window). 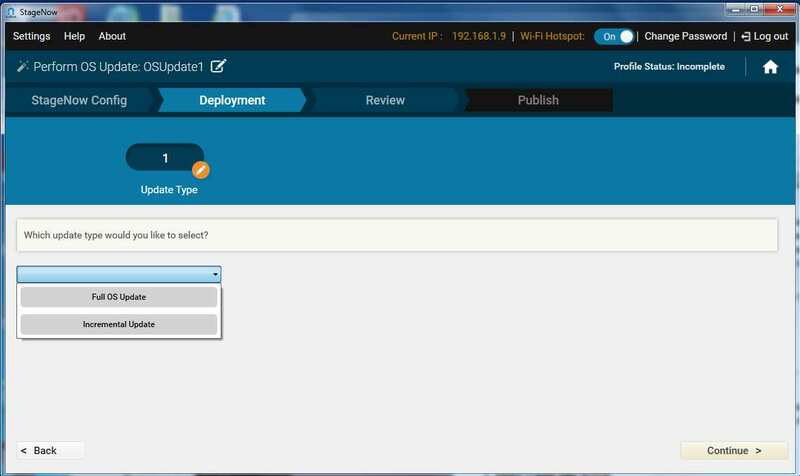 In the Deployment section, select "Incremental Update" from the update type drop-down menu. Note: If selecting Full OS Update, go to Step 8 of the previous section. 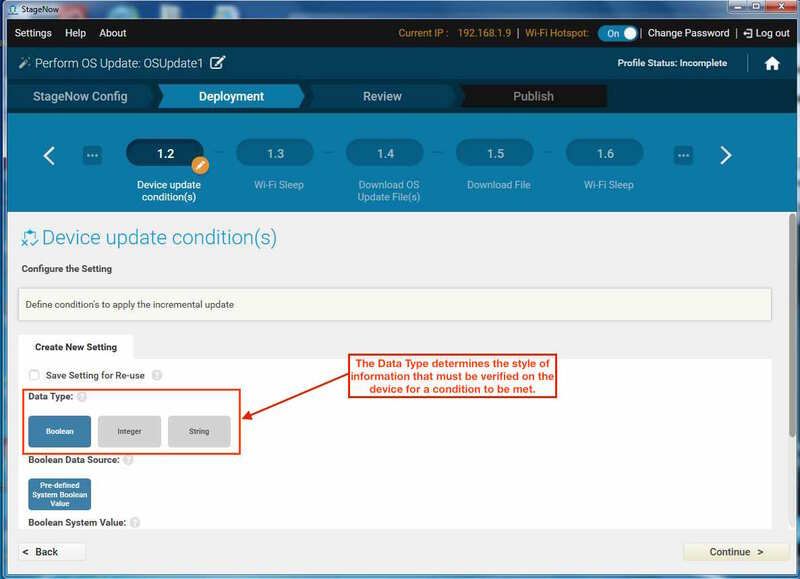 Define the update conditions and click "Continue" (see the Condition Manager guide for more information). When finished entering file information, select "No" and click "Continue" to proceed. 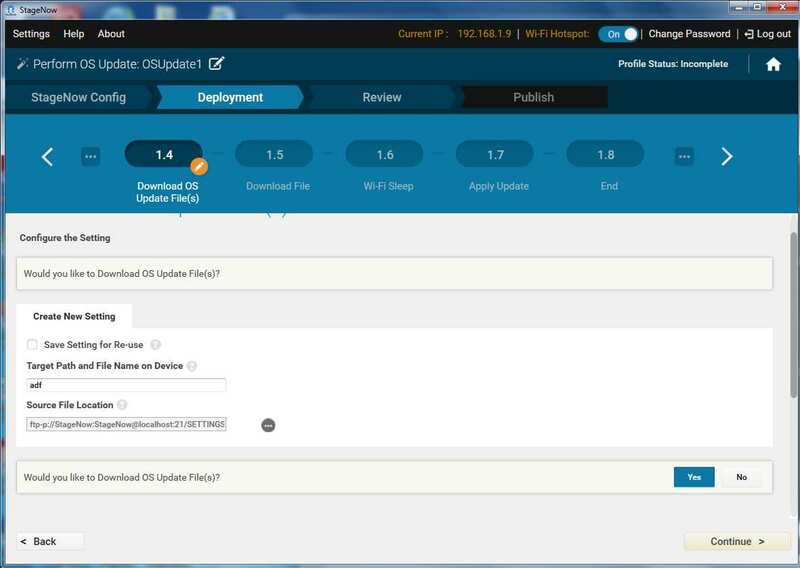 IMPORTANT: If applying multiple OS update packages at one time, a .upl file must also be downloaded to the device (see Setting Types > File for more information). 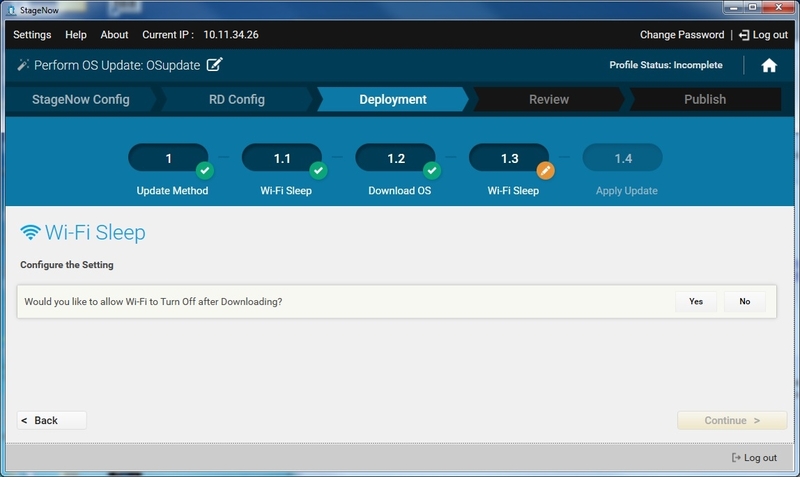 Select whether to change the Wi-Fi sleep policy after download, and click "Continue" to proceed. 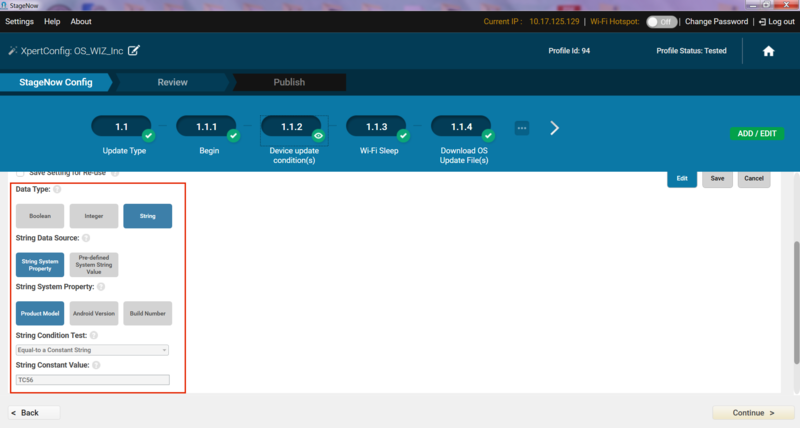 On the "Apply Update" screen, enter the information for the .zip file(s) (and .upl file, if applicable), and click "Continue" (see Setting Types > File for more information). 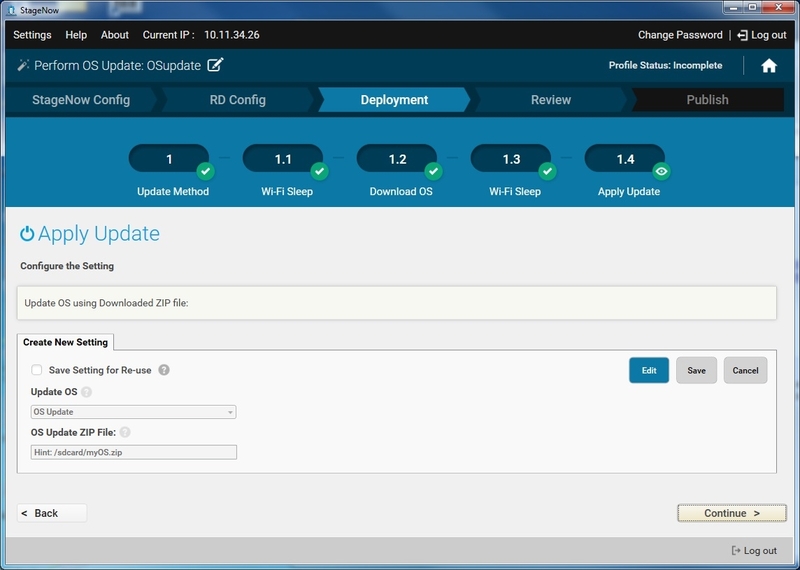 Select "Complete Profile" to apply the update and proceed to the Review window.